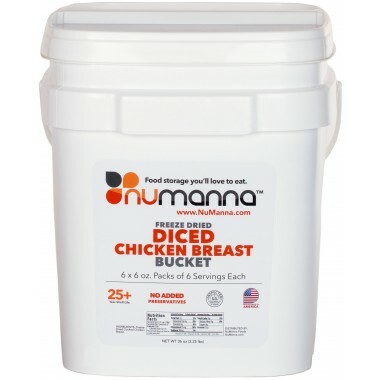 NuManna’s new Freeze Dried Diced Chicken Breast is 36 servings of nutritional, quality food, that provides you and your family the protein a body needs. Supplement any NuManna meal with this tasty, diced chicken. And you can enjoy eating it today or years from now. A great and healthy source of protein, over 25 grams per serving. By adding our diced chicken to NuManna easy fix meals, you can serve up complete meals to your family.